And with that, we're done for the year. With a 3-1 loss at home to New England, New York City's inaugural season is over. What a year it's been. Not as successful on the pitch as we all would have hoped, but everything else has been a resounding success. 20,000 season ticket holders. Nearly 2,000 Third Rail members. 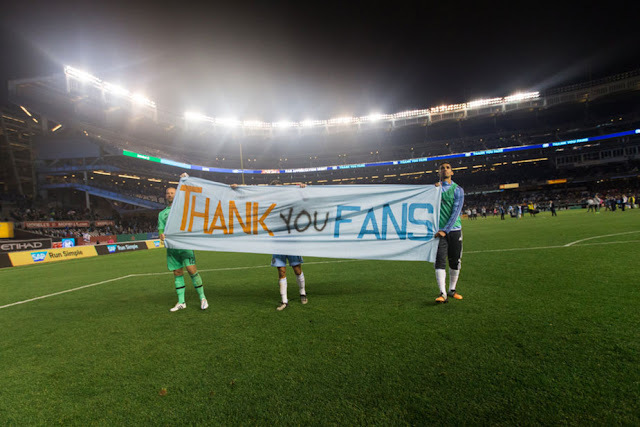 We've shown that New York is a soccer town through and through, and MLS will never be the same. I am proud of everyone who's been a part of this amazing season, from the die-hards who traveled across the country to the Third Rail members who showed up to help paint the tifo, to the parents who brought their kids to their first soccer match. And I'm especially proud to have been a small part of it myself. Come next season, I'll be in Yankee Stadium with my kids, cheering on our boys in blue. I hope to see you there.